The graduation is tonight so I will stop now. I made a Ti leaves lei. totally jealous of all the leis! what a great gift ! Audio, your earrings holders are super cool. and the note cards are just as good. Haunted wall paper too for the Haunted Mansion closet? Wow, I hope you will share a picture when you will be done. It should be fun to admire and might inspire some of us to make theme closets too. I will be sharing, hopefully soon. I keep working on it but i don't have much HM stuff yet so basically it is just a purple room haha. I keep putting off painting my dresser which is probably the #1 thing that will bring the room together. About the lei's. You made 26 candy leis? OMG! You are superwoman. I love the candy ones. Thats such a fun idea. Im late to the lei game. All we had were ribbon ones here in Texas. So I have questions. Are the tea leaves real? What are the coconut ones made out of? Those are so cool! Awesome job. Those little flowers are gorgeous. After graduation do they keep them forever? I would. I finished my blackberry waffle socks last night. Im wearing them right now for probably the last time until November. I used thicker yarn and its 100% wool so these are super warm. Ill wrap them around a favorite tea bag and tuck them in the sock box to surprise me on the first cold night next fall. These knitted up in two days which is going to make my next pair of socks feel like a really long process. But thats cool. Socks are supposed to be my purse project for when Im in line or at the movies or at the playground. If they all went this quickly I would run out of yarn. Gosh! The projects in this thread are so motivational. Those purple socks are gorgeous! Now I REALLY want to master knitting with dpn's. The leis are amazing, the skeleton wedding piece is beautiful, the octopus is so fun! I'm digging so many of these projects. Those socks are beautiful!! I admire sock knitting so much! I love socks and wish I had more handmade pairs. Maybe I'll wish for a pair next time I do the ongoing wish swap. 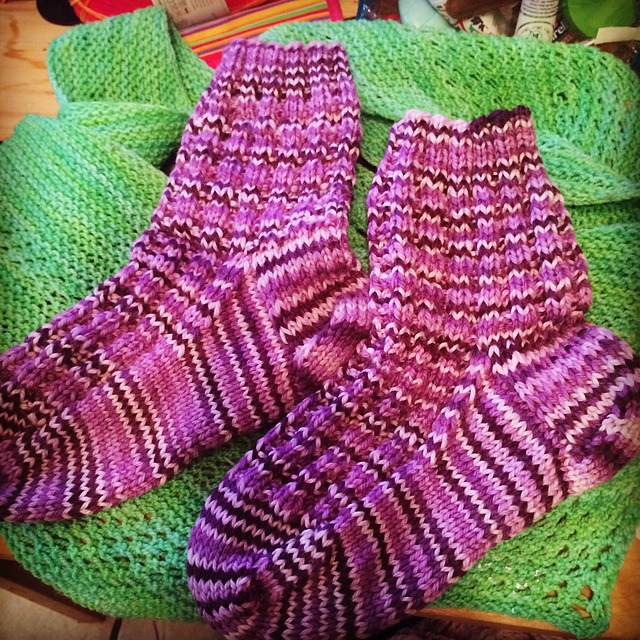 I'd really like a pair that uses up left over sock yarn, all miss matched and random. I'd wear them all the time!! Oh do it do it!! Im a sock pusher. Im a very newbie knitter and DPNs have been an experience. I dont know too much about technique but getting the right DPN has made all the difference. So far I love knitpicks wooden ones and I am trying out karbonz for the first time this week. I usually use magic loop on addi turbo sock rockets. They are magic.